Young Englishman, Philip Ashley (Sam Claflin), plots revenge against his mysterious and beautiful cousin, Rachel (Rachel Weisz), believing that she was responsible for the death of his beloved guardian. However, his feelings become complicated when she comes to stay and he finds himself falling helplessly and obsessively in love with her. 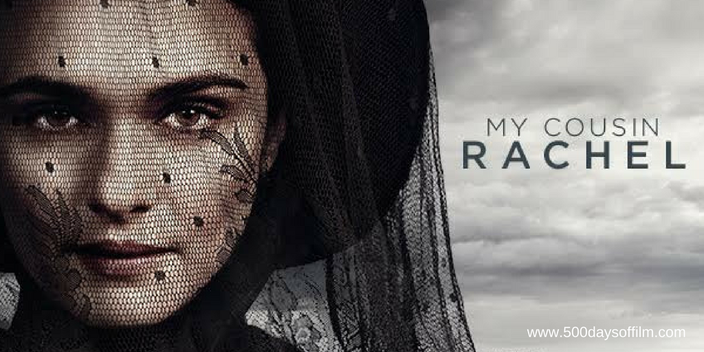 My Cousin Rachel is a lavish and utterly gripping costume thriller. Featuring many delicious twists and turns, Roger Michell's film will keep you guessing until the very end and, most likely, for a good while after. Who is Rachel? Is she a murderer or just a woman ahead of her time? Is she a threat to Philip or is it Philip, unable to cope with her desire for sexual and financial freedom, who poses the real danger? My Cousin Rachel toys with our perceptions of Rachel from the beginning. Like Philip (and thanks to a series of troubling rumours about her 'appetites'), we judge Rachel long before her arrival on screen. Philip is determined to make Rachel pay for her role in his cousin Ambrose’s death. However, she wrong foots him from the start and appears utterly charming to everyone. Inexperienced and naive, Philip is no match for Rachel's mysterious, worldly charisma and he falls intensely in love with her or, perhaps more accurately, his idea of her. We can never be sure of Rachel’s true intentions - is she after Philip’s heart or his inheritance? Is her herbal tea restorative or deadly? It takes significant acting talent to embody the ambiguous literary figure that is Rachel. Thankfully, we are in safe hands. Rachel Weisz gives a superb, powerful and enigmatic performance. Like the characters in this film, we cannot take our eyes off her - analysing her every move and expression, searching for clues. The sense of mystery surrounding Rachel is compounded by Michell's decision to frame her in a doorway, through a window or beneath a veil. In a BBC Radio 5 Live interview for Kermode and Mayo’s Film Review, Weisz explains that, in order to play Rachel, she had to decide whether she was guilty or innocent. “To me, it seemed quite clear, after some thought,” the actor explains. Intriguingly, Weisz kept this decision to herself - she did not even disclose her conclusions to Sam Claflin. As for Michell, he did not want to know. This enabled him to maintain control of My Cousin Rachel's mystery and consistent atmosphere of ambiguity. Sam Claflin is very impressive as Philip. His portrayal of this impulsive, petulant young man and his desperate, obsessive love is utterly convincing. We fear for his vulnerability while being repulsed by his selfish, feverish need to control Rachel. My Cousin Rachel also boasts a powerful supporting cast. Iain Glen is brilliant as Philip’s godfather and Tim Barlow is wonderful as brusque servant, Seecombe. Meanwhile, Holliday Grainger is scene-stealingly good as Louise - a woman deeply in love with Philip who has to suffer the pain of watching Rachel steal his heart. We actually have Roger Michell’s mother to thank for the enjoyable thrills of My Cousin Rachel. The director revealed in an interview for BBC Radio 4’s The Film Programme, that he picked up her copy of Daphne Du Maurier’s book one evening “for a laugh”. Michell then set about adapting the novel - determined to preserve the enigma of Du Maurier's story and also explore the idea of Rachel as a modern woman with ideas ahead of her time. The end result is a success for both these objectives. My Cousin Rachel is an entertaining and satisfying thriller that will inspire debate long after the credits have rolled. I love Rael Jones’ score for My Cousin Rachel. It’s wonderfully unsubtle. This is, of course, not the only cinematic version Daphne du Maurier’s 1951 novel. In 1952, Olivia de Havilland played Rachel and Richard Burton played Philip in Henry Koster’s adaptation. However, the author was, reportedly, disappointed by this film. If you have, what did you think of this film? Let me know in the comments section below or let’s talk movies over on Twitter or Facebook!